The Santa Cruz Mountains have been recognized as a premium wine producing region since the Mission at Santa Cruz planted it’s first vineyards between 1804 and 1807, in what is now Harvey West Park. Between 1850 and 1880, loggers stripped 18 million board feet of redwood leaving large cleared areas what were well-suited to orchards and vineyards. In 1853, John Burns planted the first commercial vines in the county, calling his mountain “Ben Lomond” (Mount Lomond), after an old wine district of Scotland. At about the same time, John and George Jarvis established a winery above Scotts Valley that they called “Vine Hill”. Burns and the Jarvis’ became the premium winemakers in the county, with many wineries springing up after two local vintners won international acclaim in 1884. There were many wineries on the summit in the late 1800’s. Lyman Burrell established a winery in 1854 and there were vineyards all along the Summit Ridge, as well as in Austrian Gulch. There was one prominent winery on the Highland Ridge which was created by a German florist named Emil Meyer. He called his winery “Mare Vista”, and he owned the area’s first resistant root stocks, which avoided the root-louse infestation that crippled other grape growers in the region. His winery survived prohibition, but later closed in 1939 when his son died. None of the other original wineries survived prohibition, but several new wineries sprang up in the 1940’s. Now there are four family owned wineries in our community that are open to the public, along with many private vineyards. Many of the private vineyards, surrounding the owner’s home sell their grapes to one of the major wineries or they bottle for their own personal use. We even have a wine consultant who will advise the private homeowner about everything from growing grapes, to complete maintenance of their vineyard. The number of wineries and acreage planted with grapes has grown tremendously in the last few years as the area becomes recognized as a premium grape producing region. The individual micro climates and marine influence of this mountainous territory contribute to the production of intensely, concentrated fruit, which lends itself to the creation of superior wines. In this area only young vines are watered, so yields are much lower concentrating the sugars into fewer grapes, consequently the wine tends to be more intense. In our rough hillside terrain, an acre of land will produce a ton to a ton and a half of grapes. A ton of grapes will yield 76 cases of twelve, or 912 bottles, of wine. In 1981, the Santa Cruz Mountains Viticultural Appellation became federally recognized. This was one of the first American viticulture areas to be defined by geophysical and climatic factors. It extends from Half Moon Bay to the north and Mt. Madonna to the south, encompassing the Los Gatos- Santa Cruz Mountains. The east and west boundaries of the appellation are defined by elevation, extending down to 800 feet to the east and 400 feet to the west. A total of about 1000 acres are being farmed with wine producing grapes, making wine from this region a rare commodity. 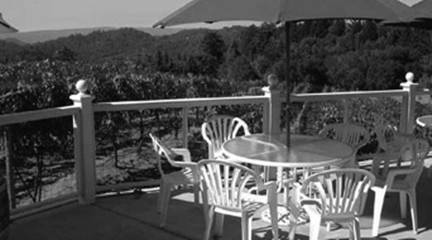 There are four wineries in the Los Gatos- Santa Cruz Mountains that are open to the public. All are family owned and operated; in fact, the owners are all intimately involved in the wine production. The two largest are on Bear Creek Road, not far from each other, boasting a cool southwesterly exposure with breathtaking views of Monterey Bay and the Pacific Ocean. The other two are on the east Summit Road side of the mountains in the shadow of Loma Prieta. They, as well, have that incredible panoramic view of Monterey Bay and the Pacific Ocean. The cooling salt air sweeping off the ocean adds to the unique quality of the grapes grown in this region. The warm days and cool nights give way to the perfect environment for the long, slow ripening of cool climate grapes, producing world class wines marked by layers of complexity and richness of flavor. Pinot Noir and Chardonnay grapes grow better on the ocean side of the mountain, whereas Cabernet Sauvignon does better inland, away from the cooling ocean breeze. David Bruce Winery is a true winery. They do nothing but make wine. It is David Bruce’s mission “to make the world’s finest Pinot Noir”, and he has accomplished this feat with hard work and a lot of ingenuity. In the process he has not only created world class, award wining wines, his pioneering work with the diversity of California grapes and winemaking techniques have greatly contributed to the evolution of the winemaking industry. David Bruce was one of the 12 California Wineries to participate in the now famous “Judgment of Paris”, which was held in 1976. In a blind tasting in Paris, California wines outscored French wines proving to the world that California can produce premium wines. The David Bruce Winery was bonded in 1964 by a dermatologist who practiced in the Santa Clara Valley until 1985. Bruce owned 40 acres at an elevation of 2,200 feet with a cool southwesterly exposure overlooking an incredible redwood forest and with an expansive view of the Pacific Ocean and the Monterey Bay. He planted the first vines himself, 16 acres with the four great grapes of the world. Nine of those acres were with Pinot Noir, and the rest with Cabernet Sauvignon, Chardonnay, and White Riesling. Now with 25 acres planted with Pinot Noir and Chardonnay, he also purchases fruit from more than 20 small vineyards, one of which is the vineyard adjacent to the Burrell School Winery. His winery now bottles 70,000 cases per year. He has also sold cuttings from his Pinot Noir vines to many vineyards throughout California. David Bruce consistently takes top honors, which is obvious upon visiting the David Bruce tasting room and seeing the multiple awards hanging around the necks of bottles. These awards are a testament to his winemaking abilities. Numbero uno, award winning, internationally acclaimed David Bruce Pinot Noir is the showcase wine of the Los Gatos, Santa Cruz Mountains! They also produce Chardonnay, and they purchase Cabernet Sauvignon, D Órsa– la Rusticana, Grenache, Petite Syrah, Syrah, and Zinfandel grapes from other growers. Lyman J. Burrell settled on the summit of the Santa Cruz Mountains with his family in 1854. He immediately started planting grapes, becoming part of the bourgeoning mountain wine industry. In 1973 David and Anne Moulton purchased the dilapidated, abandoned school house with the idea of developing a winery around the schoolhouse theme. After much needed restoration of the school building, they began the painstaking job of planting the vineyard by hand. Initial plantings in 1976 were in Chardonnay and Merlot, with Pinot Noir added in 2002. All of the maintenance of the vines is lovingly done by hand. They were a home winemaker until commercially licensed as a winery in 1994. They have six acres of their ten acre parcel planted with grapes and they own another fourteens acres of a seventy acre parcel on Mt. Umenum, with Cabernet Franc, Merlot, Syrah, Cabernet Sauvignon. They produce two-thirds of their grapes, with the remaining coming from Amaya Ridge, Mt. Madonna, and Amador County. They produce 5000 cases of wine per year and they now focus on creating better wines. At an elevation of 1600, this site is a perfect mix of warm days and cool nights to produce award winning wines from intensely rich grapes. Dave’s mission is to grow the best wine grapes possible. They even hold winemaking classes twice a year. A family affair, they hope to pass the winery on to their adult kids, who have expressed interest in seeing a continuation of their efforts. Byington Vineyards and Winery is an elegant event center showcasing their fine wines. The 18,000 square feet Italianate stone winery chateau, completed in 1990, is a jewel filled with old world charm and ambiance. The panoramic view overlooking the Monterey Bay and the Pacific Ocean, add to the allure of this magical castle. At an elevation of 2000 feet, Byington relies only on rainfall to irrigate its vineyards. In 1958, Bill and Mary Byington, purchased a 95 acre family retreat on Bear Creek Road. They planted nine acres of Pinot Noir grapes, with a vintage 1987 release. Currently, they have eight acres planted with Pinot Noir, and they purchase grapes from Sonoma to Paso Robles, buying several varieties, they are best known for their Chardonnay and Cabernet Sauvignon. They also produce a Meritage Bordeaux blend, called Alliage, that is quite well revered. 12,000 to 15,000 cases are produced each year at Byington. Bill and Mary have retired, and their daughter, Sheryl, is now the vice president, coordinating weddings, corporate events, and picnics at their incredible estate. They have built a business around the exceptional ambiance, providing an elegant environment in which to celebrate your special event. The bride and her entourage dress in the privacy of their own suite with a beautiful four poster bed and a well equipped bathroom/dressing room. Fantasy abounds! Hidden high in the Santa Cruz Mountains is Silver Mountain Winery, on the summit of Miller Hill. Breathtaking views are the focal point of this handcrafted winery at the top of winding mountain roads. Because of the ingress and egress, they do not entertain weekly winetastings, but are open on the annual vintner’s festival with a complete weekend of entertainment and gourmet foods and for Passport days. At an elevation of 2100 feet, the warm days and cool nights contribute to the hang time, allowing the fruit to mature slower, maximizing their flavor. Silver Mountain is a certified organic vineyard, lending to its uniqueness. Jerold O’Brien purchased 18 acres in 1973. In 1979, he created the original Silver Mountain winery which was destroyed in the Loma Prieta Earthquake in 1989. He rebuilt, increasing the size and efficiency. Currently producing 3500 cases per year, with a capacity of five to six thousand cases; he currently has 12 acres of wine producing grape vines, buying two-thirds of his grapes from local growers on Miller Hill Road and Longridge Road. Because of the limitations on being open to the public, Silver Mountain has recently opened a new tasting room in Cannery Row. They are known for their Chardonnay, Alloy (Bordeaux Blend), and Pinot Noir wines. David Bruce and Byington have winetasting from 11AM to 5PM daily. Burrell School has winetasting from Saturday and Sunday from 11AM to 5PM. Saturday of most months from 11AM to 5PM. mountain views, as all of the wineries encourage picnicking. There is generally a $5 per person charge for winetasting. Each of wineries has a wine club affording discounts to frequent buyers, as well as special perks for club members (usually including free winetasting). Check the websites for more details. The Vintners' Festival takes place the second weekend in June at wineries and restaurants throughout the area. The wineries offer special wines, food, music, art shows and other entertainment. To join the festivities, you purchase a glass at any, participating festival location. The glass is your ticket to all other festival sites. The wineries of the Santa Cruz Mountains invite you to become citizens in their Passport Program. For $25, you receive a Passport to the wineries, including many that are not open to the public at other times. You may tour the facilities, meet the winemakers, sample the wines, and learn more about what makes Santa Cruz Mountain wineries so special. Each winery will stamp the Passport, and when a completed Passport is turned in, the holder receives a reward. Passport wineries will be open to stamp your Passport on the third Saturday in January, April, July and November, as well as during their regular hours. Every Wednesday at the Shadowbrook Restaurant, Capitola, 5-8pm a different winemaker is featured. Half-priced wines by the glass, plus sample a flight of the Santa Cruz Mountains finest wines served with complimentary hors d'oeuvres from the legendary Shadowbrook Restaurant. Meet the winemaker and sample his wines. I would like to thank the winemakers for granting us interviews and for their gracious hospitality. All information contained in this article is either from personal interviews, the Santa Cruz County Winegrowers Association, or the San Jose Mercury News, June 29, 1993 “A History of Winemaking in the Santa Cruz Mountains” by Ross Eric Gibson..